Our last meeting of the year was devoted to a KOW tournament. Kit won first place with Orcs in a field of 8 players. Flames of War. Ben (Germans) played Steve (Soviets). In a second game, Ben's Germans played Kit's US Bastogne army in the cauldron. 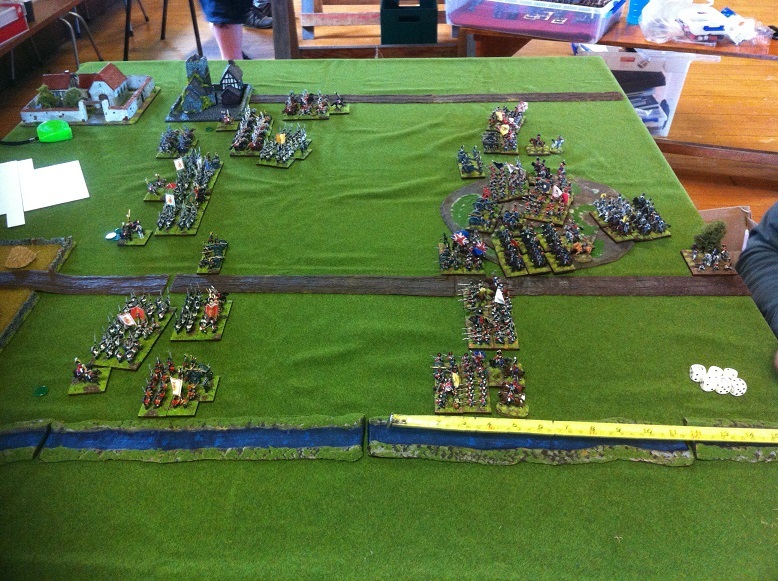 Flames of War - John (Germans) played Rob (British) in a 3000 point game. 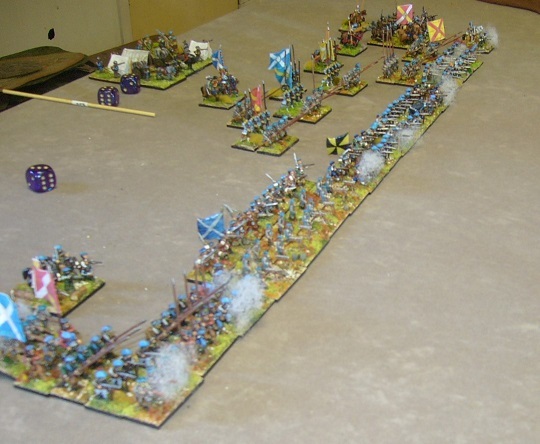 We also discussed running a one-day KOW tournament in the first meeting of December. More details to come. A couple of games for people not at competitions yesterday. FOG-N: Brett (French) played Stuart (Russian) with another playtest of some potential rule changes. 15mm Medieval: Alan (Castillian) played Kendall (100YW English) using Kings of War Historical and then L&apos;Art de la Guerre. Verdicts - KoWH is fun but not particularly serious although if both players make a more historical army then it&apos;s a nice, quick set of rules. LADG is a bit like a mashup of all the best parts of FoG and DBx, size is comparable to DBMM240. Quick and enjoyable game and can see why it&apos;s picking up traction in Europe. DBMM - Al (Tudor English) played Philip (Saite Egyptian) - a practice game for Heavy Metal Con coming up in a couple of weeks. FOG-N Andrew (British 1815) played Philip (German Confederation 1814) playtesting some new rules. Andrew got the win using an outflank. Kings of War We had four KOW games today - Rob visiting from SAMWC had a couple of games with his Abyssals against Rob's Herd and Alan's goblins. Brett's Elves took on Rob's Herd and Alan's goblins. As well as the second day of POP, there was one other game at the club today. Brett and Andrew did some FOGN playtesting, using Austrians and an 1813 multi-national corps. There are 12 players at Push of Pike. This year's tournament features European armies 1618 to 1665. Brian won the prize for Best Army with the Scots Covenanters. Another good turnout with quite a variety of games being played - Tanks, Halo Spacefleets, Kings of War, Flames of War, FOG Napoleonics, and DBR (a practice game for Push of Pike next meeting). Today's club meeting was devoted to our Kings of War tournament, which was also the club tournament. Brett took first place in both competitions. Flames of War. We had three WWII games today - Lee and John, Lee and Rob, and Kit and Steve. FOG-N. Brett's Austrians and Russians beat Philip's Anglo-Dutch. Kings of War. Mike had a couple of practice games with his new Abyssal army, against Rob and Alan. Panzerschreck is coming up next weekend, and in preparation for that, John, Ray, Rob and Steve had a couple of practice games. 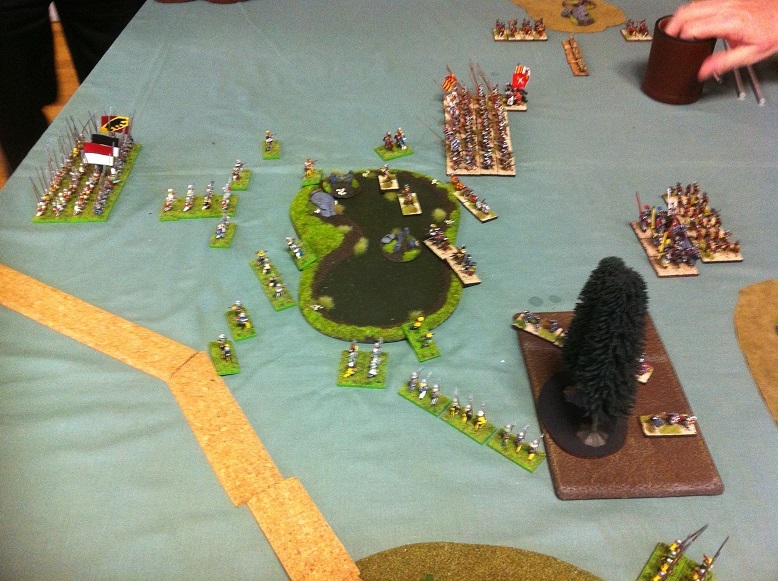 Also next weekend is the Melbourne FOG-Napoleonics tournament. Andrew and Brett gave the Eylau scenario a test run. Brent (1813 Prussians) beat Philip (1815 British) in a standard game (non-scenario). Kings of War - Alan (Goblins) played Philip (Kingdoms of Men).